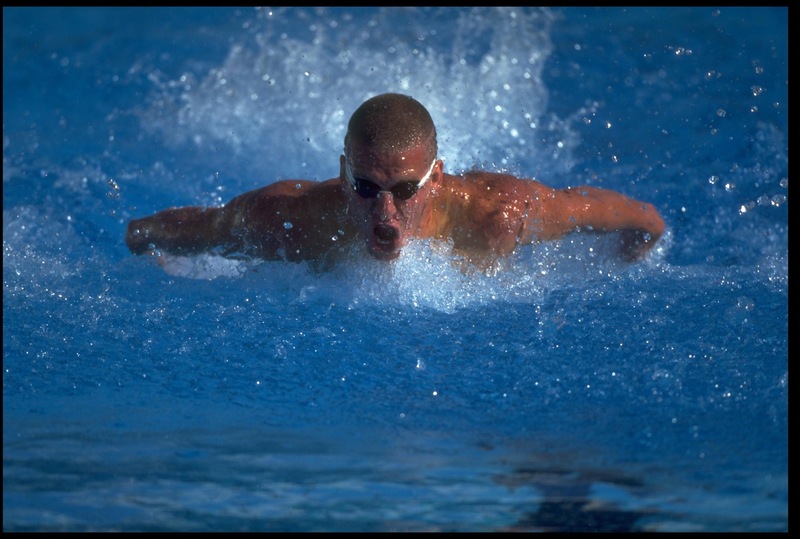 Mark: Not many people know that I began swimming because of a physical ailment. I collapsed on the basketball court when I was 9 and couldn’t get back up. The diagnosis was that I wasn’t born with enough cartilage in my major joints. So, I had less “ cushion” in my knees than most people and my tendons would end up banging against my bone during impact sports which would eventually cause my tendons to give out. I was playing a lot of sports with my group of friends at that point – baseball, basketball, football and swimming and the doctors told us that I could only swim until they figured something out. It was devastating news to hear as a 9 year old, but my parents treated it as an opportunity and the rest is history. Adam: What is something that would surprise people about the life of an Olympian? Mark: Wow! There’s a lot we could discuss here…I’ll give you a funny and serious one. Most Olympians get tattoos of the Olympic rings somewhere on their body once they make the team. Just the culture. With that being said, you have to stay in decent shape so that your rings don’t become “distorted”! Mine is on my hip – right about the suit line…so guess who’s on the Peloton and working out much more than they want! On the more serious note, I think people would be shocked at the lack of valuable resources for Olympic and World-class Athletes to help them with the transition from sport to the working world. I’m specifically talking about help with finances, health insurance, getting a job and dealing with the psychological transition. Most of these athletes have sacrificed or been told not to do internships, so they are retiring in their late 20’s or early 30’s with no working experience. It’s a subject I’m passionate about improving. Mark: That’s an easy one. My most epic failure was at Olympic Trials. I was seated first going into finals and had a really easy swim in prelims that lead to a best time and bit of over confidence. Only the first two people who touch the wall at finals go to the Olympics. I was ranked 2nd in the world at the time and considered a top medal contender. I had my two idols on each side of me (Matt Biondi and Pablo Morales) who took my event (100 butterfly) out fast. I typically was 5th or 6th at the halfway point and ran everyone down on the back half of the race. On that night, for some reason, I decided I would change up my race strategy and take it out fast to mentally take my competitors out of the race. At the 50 meter mark I was in first by a half body length and ahead of world record pace. The crowd was going insane! I remember coming off the wall and seeing no one near me and thinking I’m making the Olympic Team! That thought came to a crashing halt about 10 meters from the wall when the proverbial piano fell on my back and I literally could barely get my arms across the top of the water. I went from 1st to 7th in less than 7 meters. It was a life changing moment and brought with it a ton of valuable lessons that have helped me achieve success in sports, my post-competitive career and eventually lead me to start my own sports-related business. I’m not going to lie, it was a really hard lesson to go through, but I came out the other side much stronger and smarter and made the Olympic team 4 years later. Adam: What are the best lessons you learned from the achievement of becoming an Olympian and then a gold medalist? Mark: Worry about the things you can control and embrace the failures as ways to get better, not ways to beat yourself down. During my athletic career I stuck with three important things that I felt separated me from a lot of my competition. First, when I had a bad event at a competition, I obsessed over figuring out what I did wrong so that I could do better on the next event vs. pouting, throwing a tantrum and not talking to anyone. Second, I consistently worked hard and focused on a specific part of my race at every practice. A lot of people just come in to workout (or work) and do what’s asked and leave. My parents really pushed the old saying if you’re going to do it, you might as well give 110%. Finally, I realized at a young age how important the people around me were to my success. I made it a point to be around people who were smarter than me, faster than me and supported me through the ups and downs of sports. This gave me the confidence to try new things and fail without stressing or worrying about what others thought. My parents, my coach, my teammates and my friends all deserve just as much credit as I do for my achievements. Adam: In your experience, what are the defining qualities of an effective leader? How can leaders and aspiring leaders take their leadership skills to another level? Mark: Three things. 1. Take ownership of the team you’re leading. Never point fingers. If someone on your team is not performing, it is on you as the leader to find a way to enable their success. 2. Put a big emphasis on creating an amazing culture at your workplace. Employees who trust and are encouraged by their colleagues will perform at a much higher level. 3. Make sure your employees/teammates are super clear about what’s expected from them and that they have the tools to achieve those goals. Then acknowledge their wins. Adam: What are the three best tips applicable to entrepreneurs, executives and civic leaders? Mark: Make your mental and physical health a priority. You won’t be effective at achieving your leadership goals if you’re not there mentally or physically Make sure you have some work/life balance. I’ve seen way too many amazing entrepreneurs and executives get mentally and physically burned out right at the busiest time of the year for their company. Surround yourself with people who are smarter than you and support their achievements whole-heartedly vs. acting jealous or trying to one-up them. Mark: Make your health a priority! When I first started this company, I was working crazy hours (14-16 hours/day) to get it off the ground. After a few months, one of my co-founders who’d already worked at a number of successful startups pulled me aside and told me that my passion and goals for the company would be worthless if I wasn’t around. That’s when I started following Thrive Global and podcasts like Rich Roll who taught me the benefits of getting enough sleep, meditation, life balance, eating a plant-based diet and training smarter. A couple months later, my weight was down, energy levels were higher, I was more focused and my productivity at work increased even though my actual business hours significantly decreased. Adam: What is the one thing everyone should be doing to pay it forward? Mark: Everyone should be using the knowledge they’ve gained from their social, work or athletics experiences to help others. I guarantee you that you’ve learned some amazing lessons through the ups and downs of life. That information is powerful and can make a big difference in someone’s life. Now there are amazing mediums that enable you to share this amazing knowledge with anyone who has access to the internet (Thrive Global, Reddit, Quora, Medium and The Athletes Village). You don’t need to be an Olympian or an “expert” to help others, you simply need to listen and share what has worked for you. Age definitely bring wisdom and the power to help others. Mark: My hobbies include most outdoor activities ranging from stand up paddle boarding to wakeboarding, snowboarding, fishing, hiking and mountain biking. Looking from the outside at them, they have really created time and stronger bonds with my family and friends. They’ve taught me to be present in the moment, given me an outlet for stress, strengthened my friendships and benefited me both physically and mentally through exercise. I’m also really into music which is honestly more beneficial to my personal time. Music has been powerful in my life in so many different ways because of it’s incredible ability to change my mood. It can give me energy when I need it, distract me from pain, calm me down and actually transport me from tough times to a great memory. Adam: Is there anything else you’d like to share? Mark: One really important thing that we didn’t touch on and a major factor for my success in sports was my parents. They actually parented me in a way that enabled my “success” in sports and later on in my career. They were always positive and downplayed the end results. They never judged me or got too emotional when I won or lost and never told me what I could have done better. They simply told me they loved me before every competition and how fun it was to watch me compete and be a part of team. I learned from their actions that life went on when I didn’t perform well at a competition and that I could get joy out of other’s accomplishments. They constantly reminded me that the people I met along the way are the true rewards of competing in sports and it turns out they were right!